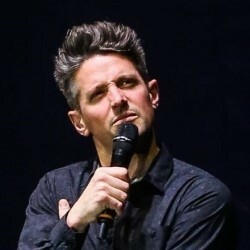 I recall reading an interview with Stuart Goldsmith a while back—it might even have been in this publication—in which he discussed how his popular podcast, The Comedian's Comedian, begun largely an excuse to find out how other comedians do what they do. Well, it's worked. Essentially, this year's show is an hour on the biggest upheaval in Goldsmith's life – having a child and getting married. There's a fairly recent salt 'n' pepper thing going on with Goldsmith's hair, lest we miss the point that having a child is not without implications. And it's this not-entirely-adventurous ground we largely stay on. And that's fine, because, as they say, it's the way he tells 'em. Where Goldsmith excels is as a performer. He's a consumate technician, and that's clearly the focus of his art. Really, it's like watching a beautiful Swiss clock tick away. Every beat is carefully weighted, every piece of linguistic misdirection and moment of intense eye contact is meticulous and considered. And, while the material is the stuff of domestic life, the punchlines rarely are the ones you'd expect. Indeed, he does a wonderful line in toying with audience expectations, seeming to credit us with the intelligence to get there before him, but really giving us the rope to hang ourselves. "You're hacks!" he berates us, after we take the easy option – a route he rarely takes. Someone ought to get Goldsmith on to their podcast to tell them how it's done.